At mile 11 my best ended. I was moving at a pretty good clip for most of the race, able to keep my pace somewhere between 9 and 10 min/mile as I expected. But, as I ran through the Capitol it started lighting, then rain, suddenly my shoes turned to cement boots and my legs to silly string. I checked my watch, my pace had slowed to 11:30, racers were passing me left and right. Self-doubt took over. My legs had nothing left. I checked my fancy race watch, I had only gone .3 miles more. I wasn't going to finish the race. I looked up, and I could see W on the corner of Elizabeth St. (at 6'5" he is pretty easy to spot from far away). As I slowly neared I could see my mom and W's mom & dad all cheering and waving. Time came to a stop. I looked at my family cheering me on and it all came back to me why I was there. Earlier that day W finished his 2nd ever 5K, I couldn't be prouder. Exactly one year earlier he was on that exact same corner cheering me on in my first distance run, but 50 lbs. heavier and would have thought you were crazy if you told him he would be racing one year later. Together this summer we kept each other going in our training. He is a true testament to hard work and commitment. I could see in my mom's face, she knew I was struggling. I really do have the greatest mom in the world, she so supportive, even when my activities worry her about my health and safety. Mr. & Mrs. W have made me feel like a part of their family from the moment I met them, always so loving and supportive. Life is good, and beautiful, and I am so lucky to not only have two legs that can take me 11 miles, but I am surrounded by loving people who will get me through the final 4. I made this 15 mi. commitment to support critical Alzheimer's & dementia research to protect them, us, our future, your family, your future. I made this commitment so that if someone we know is facing this disease, there is a safe, supportive place to not only learn about Alzheimer's and how to live with the disease, but that there is a community to lift them up through the journey of the disease so no one ever has to feel like they are facing this terrible disease alone. It was written as plain as day across the front of my shirt. Damnit, this mile is worth $40, and so is the next one and the three after that. I closed my eyes. Smiled. Then picked up the pace. I would be lying if I said the last 4 miles were smooth sailing to the finish line. I kept reminding myself to keep smiling, in my brain I think everything is easier if you are smiling. As I headed in for for the last .7 mi. I started to doubt that I would be able to finish. I was able to gut out the last 3.5 miles, but I was done. I have never felt that kind of intense fatigue. I am pretty sure my self-talk for that last .5 mi was out loud. And then out of nowhere the entrance to Laidley field appeared. And my great friend and track buddy Marshall was there, I am not sure I have ever been happier to see anyone's face! He gave me a double high-5 as I nearly tumbled into the stadium. 300 meters to go. Hot tears fogged up my sunglasses, I could hear Mrs. W cheering my name from the other side of the stadium. 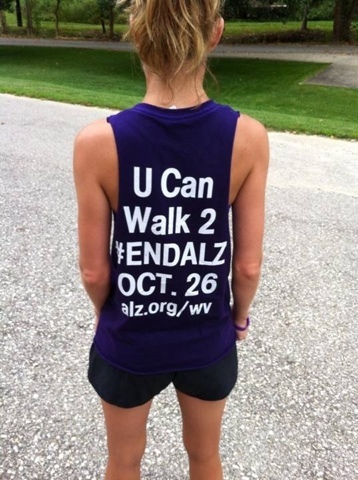 As I rounded the familiar turns of Laidley field, flashes of our great volunteers and staff appeared in my mind, our mission and our upcoming Walk to End Alzheimer's. I saw my mom in the stands and knew I could finish strong. Locked eyes on the finish line and pounded out the last 100 meters. 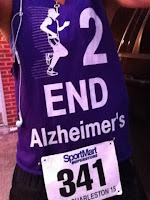 I know that my 15 miles to END Alzheimer's is a grain of sand in mountain that is the end of Alzheimer's. But, stones, boulders and mountains are made of sand. By putting our passion to work, conquering our own challenges and rallying together we will reach our ultimate vision of a world without Alzheimer's. Monday our offices are closed in honor of Labor Day. However, our 24/7 Helpline is always available at 800.272.3900. IT IS WALK WEEK!!! Our first one of the year! We can not wait to see everyone in Beckley, Parkersburg, & Martinsburg! While I wish I could be at all of them, I am headed to Beckley! If you will be at Beckley too, be sure to say hi to W at registration! Walk week means BANK DAY is Wednesday!! Bank day is your opportunity to turn in your team funds and pick up your Walk to End t-shirts! To find out details about bank day for your Walk, email, wvinfo@alz.org. - Renee Morris, Mid-Ohio Valley Walk & Alzheimer's Association staff member!! 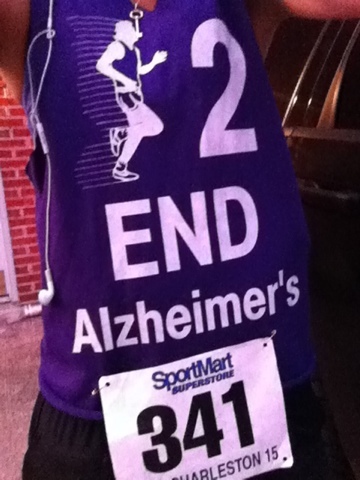 Just a reminder upload your photos and Walk to End Alzheimer's fundraising events to our Facebook page! We love sharing! You never know when your idea will spark someone else. Tuesday we have a meeting with Congressman McKinley in Wheeling. Advocates and caregivers are gathering to talk about their experience with Alzheimer's and what he can do to support families facing Alzheimer's disease. What would you share with Congressman McKinley? Email us at wvinfo@alz.org. Whew! It is going to be a busy week! When I am training for a distance race, I am hungry all the time! But, I really lose my taste for meat, so I am always trying different vegetarian dishes. As a Texan, I learned early, tacos are always tasty! W came home from work as dinner was nearly ready. His first question, where's the beef? I couldn't help but laugh out loud, his expression exactly like the grandma in the 80's Wendy's commercial! Don't worry, he ended up really enjoying our meatless filling! Start with 2 cups of water and 1 cup of lentils in a saucepan over medium heat. Time for the spices. If you have taco seasoning in a packet add about half of the packet. Our little family is sodium conscious, so I make my own blend, starting with 1/2 tbs. of cumin. 1 tsp. of chili powder (more or less depending on how spicy). 2 tsp. onion powder and 1 tsp. of garlic powder. Rinse a can of black beans. I suggest rinsing because often the juice black beans are stored in is chock-full of sodium - and again we are a sodium conscious family! Stir in the beans with the lentils, and let them simmer together for 5 more minutes or until the beans are warm. Add as many sides and condiments as you like! I love these little peppers, they are so crisp and flavorful! At the last minute, juice half a lime into the beans and lentils. Build your taco to your liking! Salsa, taco sauce, cheese, lettuce, avocado, sour cream..the sky is the limit!